Designed to mount onto the Eppley SMT Tracker, this assembly allows for the ventilation and shading of up to two Pyranometers or Pyrgeometers. The instruments are mounted in Ventilation units built into the mounting plate above and to the rear of the tracker housing to provide a clear field of view. The shading disks (options for one or two) cast a proper shadow on the instruments as the tracker follows the sun by using the elevation drive of the tracker to perform the shading disk tracking. The standard 10 to 1 ratio is maintained by using the 6 cm diameter disks at a distance of 60 cm from the receivers of the global instruments. 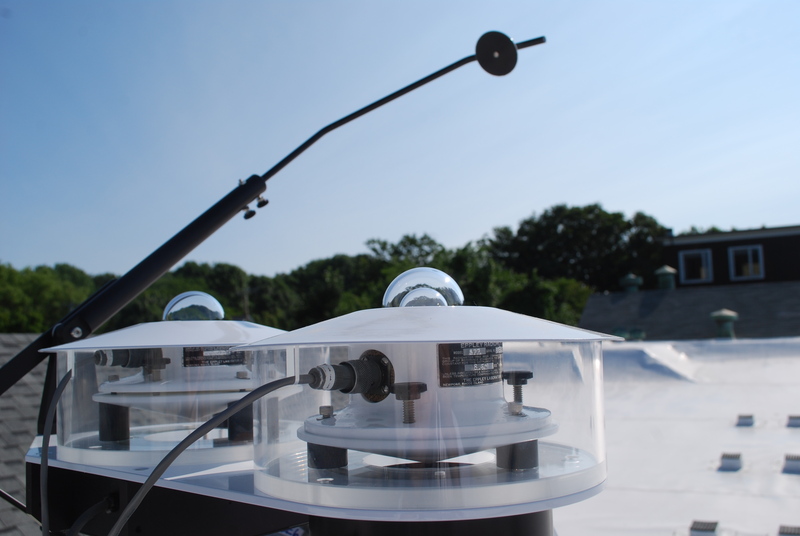 A typical layout for the Meteorologist would be to shade an 8-48 Pyranometer (Diffuse) and a PIR (incoming longwave) while a PV Performance Station would opt for a single shade arm for an 8-48 (Diffuse) and use the second position for an SPP (Global). We can also supply three position mounting plates on request.